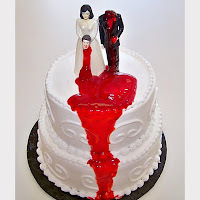 Devious divorce cakes by Fay Millar. I have a friend who's quite into novelty cakes. She's a big fan of the site Cake Wrecks, and in fact runs her own small business selling "adult" cupcakes. I think she'll get a real kick out of this. I did. Thanks for sharing. Dark, yet devilishly sweet.